The winds came last night. I don't really like the wind. It blew the leaves from my trees. I wasn't ready to bid adieu. So not ready for Winter yet. Great images and I am with you, too early for snow. 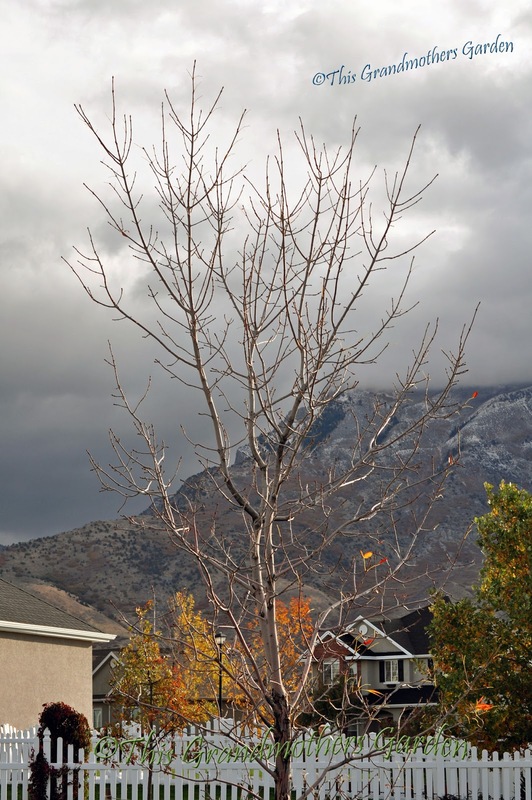 We have wind today, but we get the higher winds on Wednesday, 45 mph to 55 mph, so our trees should be bare as well. 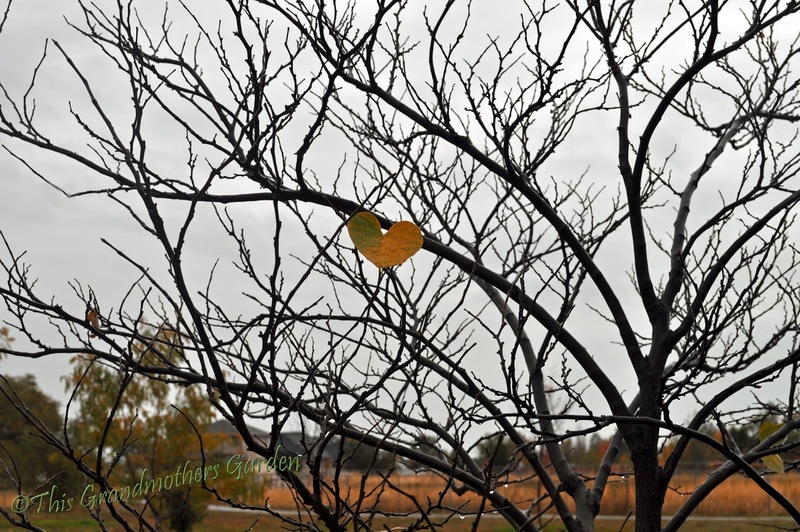 I love the picture of the lone leaf on the tree in the shape of a heart. How pretty! I agree with you, I'm not ready for winter either and the wind we are forecast for later this week is no fun. Wow, that single heart of a leaf makes for an awesome photo op! Quite fitting for your transition from fall to winter. Beautiful pics! The changing of the seasons fascinates me. We never see it here. Trees stay almost the same all year - no autumn leaves and definitely no snow. It's amazing how quickly it changes. Although still warm here, I know it's coming and I just can hardly stand to think about the japanese maple being bare! It's really the only bit of fall color I'll get as far as tree color! Sad isn't it? 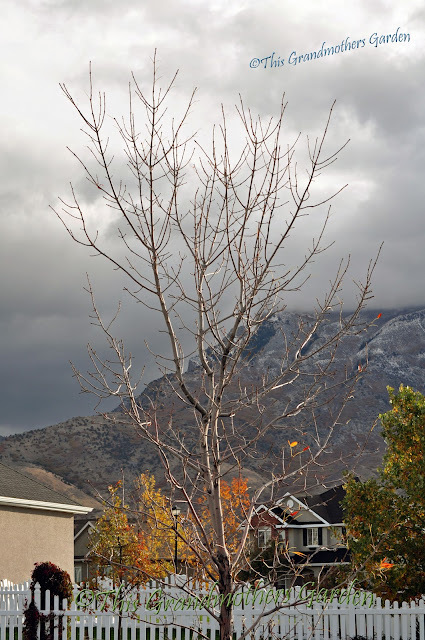 I must say though the contrast of the bare tree to the sky is most beautiful as are your views of the snow dusted mountains. 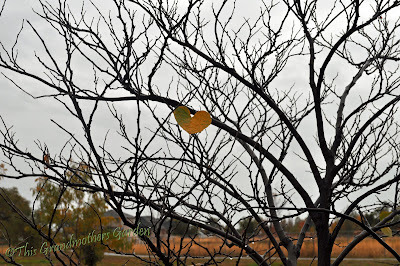 There are a couple heart images today...did you see One's blog post today? He had an interesting shot of a heart leaf too! We must live close to each other? We had horrendous wind today too and snow in the mountains (but not in my garden, thank goodness). I'm not ready to lose leaves and have everything bare (let alone have snow) yet either. I hope it warms back up! Here in Pennsylvania, it's still feeling a bit like Indian Summer, but the cold, barren fall will be here all too soon. I'm never ready. Yet each season has it's joys. And without winter, spring wouldn't be nearly so sweet. What an amazing view you have from your garden! I don't think I could survive the winters where you are. 3 years in zone 6b was all I could stand. Your view is gorgeous! It makes me miss Colorado...A LOT. Beautiful photos! But looks too cold! Makes me glad we emigrated to Sydney, Australia where it doesn't even get that cold in winter. 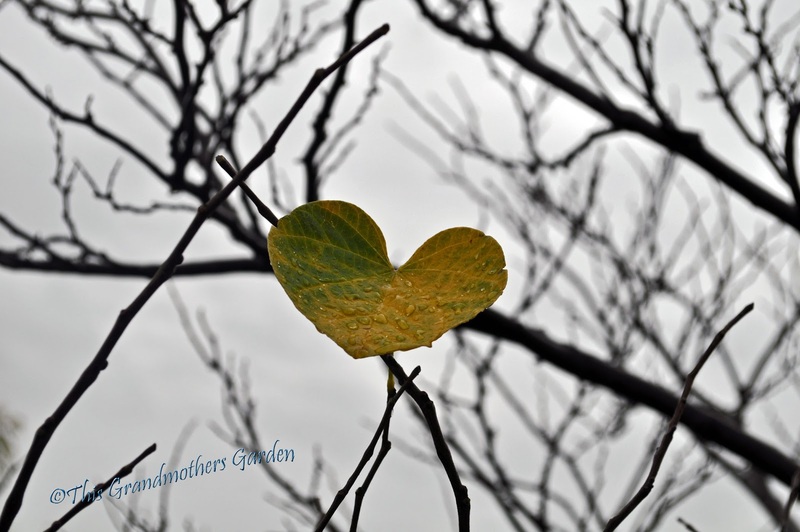 Love the picture of the heart leaf. It looks specially lonely being the only one left. I hear ya... I was so surprised to open the curtains and see so much snow on the ground! It's too early for this nonsense! Thank you for your many comments. Thankfully today is beautiful and blue and for now the snow is staying in the mountains. Yesterday I was a little shocked to see snow on the grass as I was pulling out of the driveway to go to work. 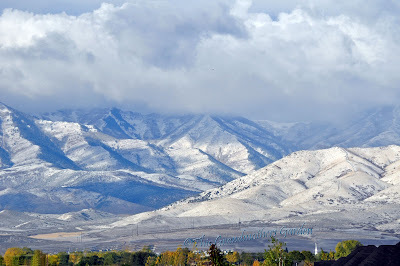 And there it was, the mountains covered with snow! The tropical blood in me is still not so ready for another winter. Snow does not mean winter! It's a part of fall too. 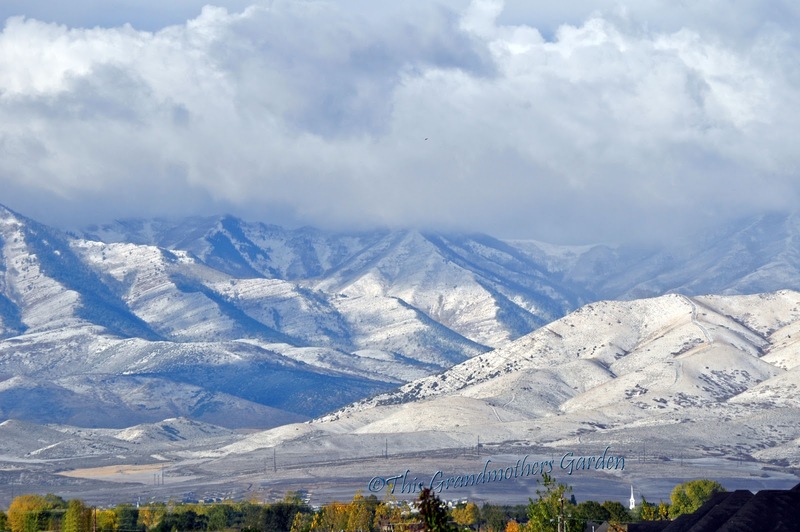 I love to see snow on the mountains. And think of how warm it has been! Hello again Meredehuit. I just saw on your sidebar that you're in Utah ~ I'm on the other side of the Rockies (northern Colorado). We must have had the same system passing thru?? Sorry you had hard frost ~ we escaped last night but maybe tonight?? It does seem too soon to have snow. Lovely photos though of the mountains. We don't see that in Ontario. Love the pic of the heart leaf. But looks so lonely, and snow I can't even imagine that at this time of year. I try to focus on the positive and think of skiing and sledding when I see the snow. But it's hard.